The British team on Louise Racing GBR820 – Grant Gordon, Ruairidh Scott, Sophia Weguelin and James Williamson – opened their Dragon World Championship with a race win that they had hinted at in the warm-up series. The forecast of strong South Westerly breezes that regularly build to a full ‘Freo Doctor’ during the summer season in Fremantle, meant that an early start was scheduled. Louise Racing led from the start, rounding the first mark ahead of Russia’s Dmitry Samokhin skippering Rocknrolla and Anatoly Loginov sailing Annapurna, to dominate the fleet. 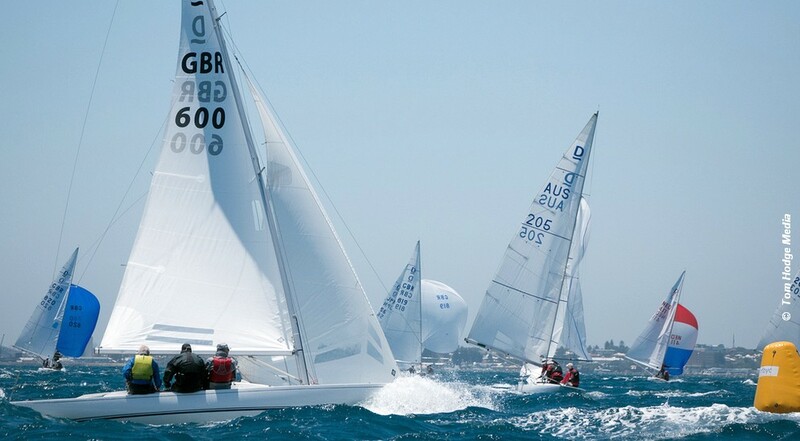 Rounding the final mark Grant Gordon just had to keep a close cover on the mass of coloured spinnakers to take his first win of the 2019 World Championships by 43 seconds. The current world champions Andy Beadsworth, Ali Tezdiker and Simon Fry on Provezza crossed in second. A very close fight for third resulted in Peter Gilmour’s Yanmar Racing Team pipping Anatoly Loginov’s Annapurna, who sailed the whole last leg with a ripped spinnaker that looked more like a string vest. Anatoly did well not to lose many more places. In fourth place was the Japan flagged Yred of Peter Gilmour, Yasuhiro Yaji and Sam Gilmour, with another GBR registered team, Klaus Diederichs, sailing Fever with Jamie Lea and Olympic sailor Diego Negri onboard in fifth place. Racing resumes on day two of the championship with two races and an earliest start time of 10:05hrs. Again the breeze is due to be lighter in the morning building later in the day.